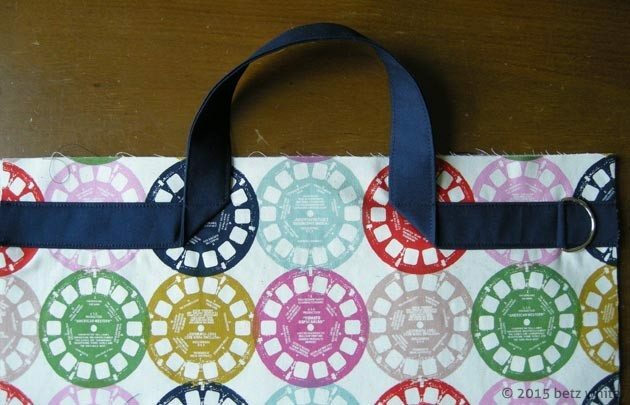 Today our task for the Field Study Tote Sew-along is to make and attach those awesome handles! I love the way they add style and uniqueness to an otherwise basic bag. Here we go! The first thing we need to do is assemble the Bag Front. 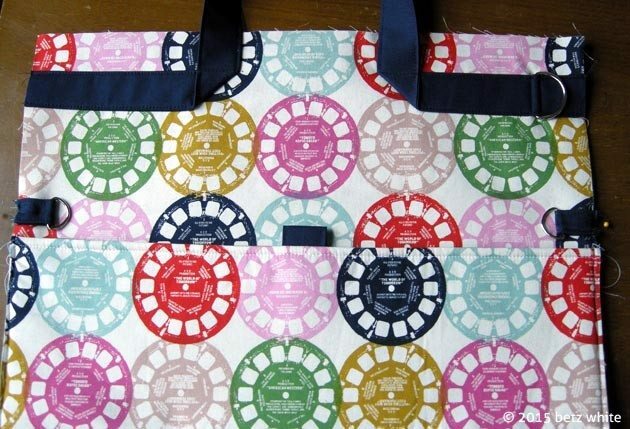 Place the remaining Lower Panel, right sides together, on top of the Bag Front piece, aligning one set of long edges. Pin and sew together with a 3/8” seam allowance. 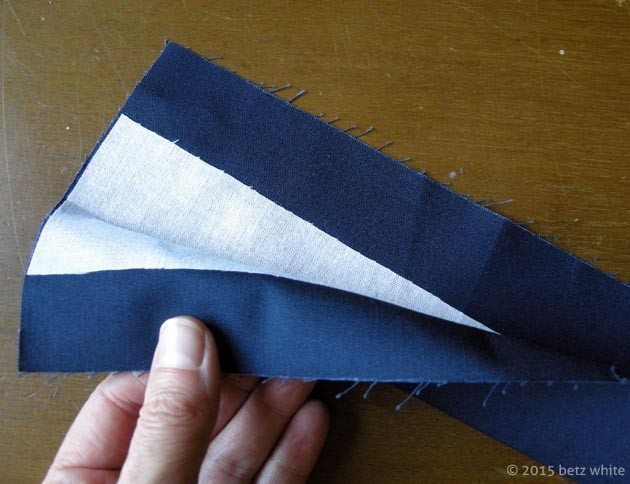 Press the seam allowance down towards the Lower Panel and topstitch the seam 1/8” from the seam on the Lower Panel. 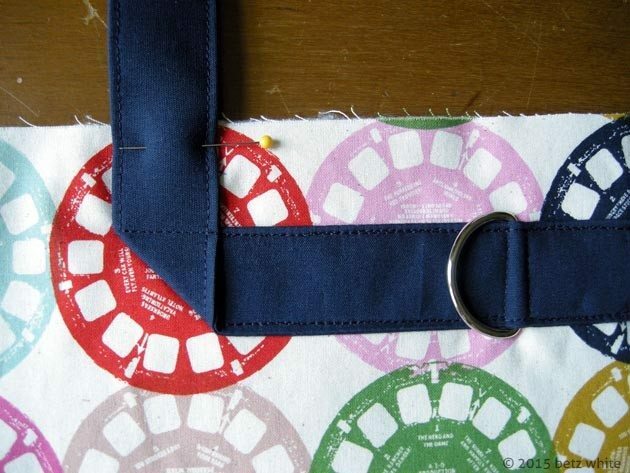 Here’s where you have the option to use webbing instead of creating self-fabric handles. 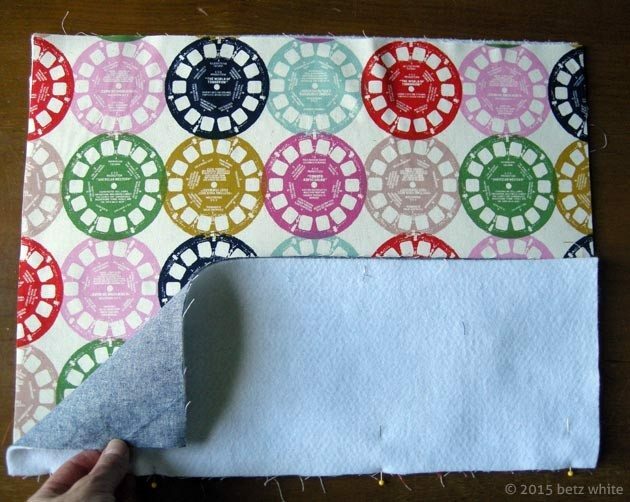 For making the Handles with Accent Fabric B, fold a Handle piece in half lengthwise, wrong sides together, and press to create a crease that runs the length of the rectangle. You ‘ll notice that the interfacing on the back runs just down the center to provide stability yet prevent the handle from being too bulky. 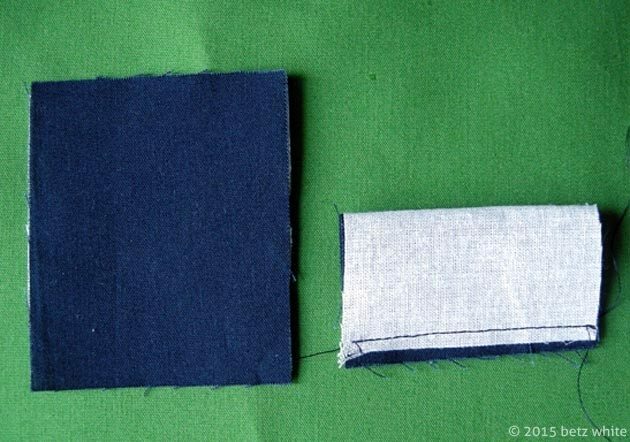 Open the fold, then fold the raw edges into the center crease and press. Refold the lengthwise folds so that the raw edges are all enclosed. Topstitch both long sides 1/8” from the edge. 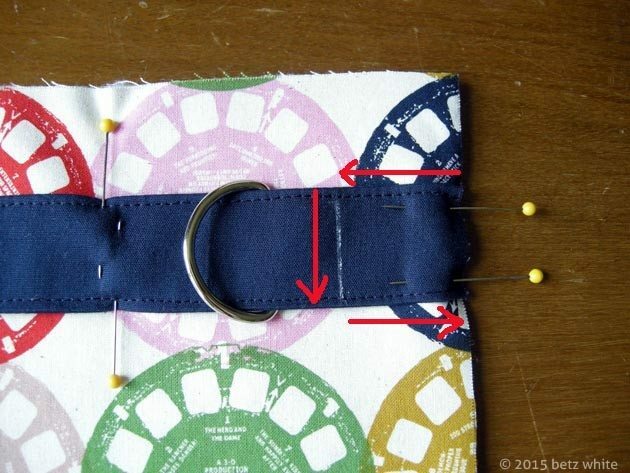 Sew the second handle in the same manner. Place one end of the sewn Handle at the right hand edge of the Bag Front, 1 1/4” from the top edge. Pin the end in place then slide one of the 1 1/4” D-rings onto the other end of the Handle. Pin the Handle in place, parallel with the top edge of the Bag Front. Push the D-ring towards the right. Measure and mark the Handle 5” from the side edge across the bottom of the Handle and 6 1/4” along the top. Stitch across the Handle as close to the D-ring as possible (you may want to install you zipper foot), pivot, then sew along the topstitching to the marking. Sew diagonally across the Handle to the other marking, pivot, then sew back to the beginning. Unpin the free end of the Handle and fold it up, perpendicular to the sewn end of the Handle. Topstitch across the Handle, backstitching to reinforce it. Align the free end of the Handle with the left-hand edge of the Bag Front, 1 1/4” from the top edge, making sure that the Handle doesn’t have an extra twist in it. Pin, measure, and mark the left hand end of the straps following the steps above, minus the D-ring installation. 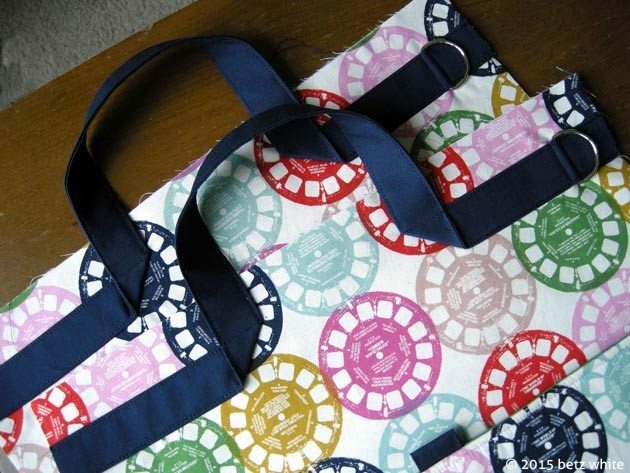 Sew the second Handle to the Bag Back, following the same process. Do not reverse the placement of the D-ring; it should be on the right-hand side, the same as the placement on the Bag Front. Fold one Side Tab piece in half crosswise, right sides together, aligning the 2 1/2” wide edges. Sew with a 1/4” seam allowance. Turn right side out, press, and topstitch 1/8” from each edge. Thread a 1” D-ring onto the sewn Side Tab and fold the tab end to end. Topstitch across the tab as close to the D-ring as possible. 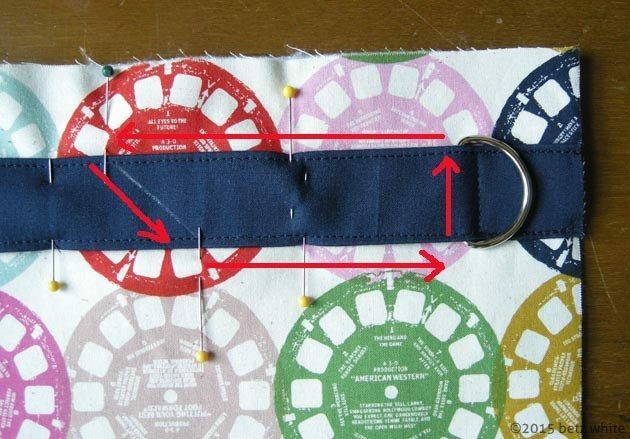 Repeat the process to sew the second Side Tab. Pin the Side Tabs to the Bag Back 3/8” above the top of the Exterior Pocket, aligning the raw edges. Machine baste together using a 1/8” seam allowance. Bag Back and Front, done! Next week: the zipper! We’d love to see your progress! Show us your photos in the Facebook Group. You can also share photos on Facebook and Instagram tagged #fieldstudysewalong or #fieldstudytotesewalong . Still need the pattern? Find it here!